The best way to describe Offermatic is this – imagine if Mint, Blippy and Groupon went off to Vegas for the weekend, got wasted and ended up in bed together. Nine months later, out pops Offermatic . Like Mint, Offermatic is a front end user interface to Yodlee’s robust financial network. And the service digs through your credit card transactions just like Blippy does (although they aren’t posted for the world to see). 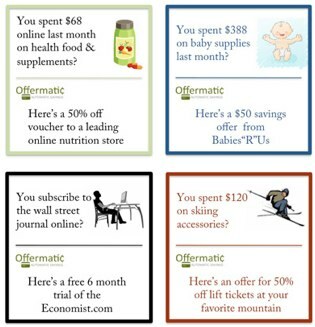 And like Groupon, Offermatic is pushing special offers to users. The result is something unique, though, and some people may love it. Here’s how it works: You register your credit cards with Offermatic via the Yodlee back end (which is secure). Offermatic then downloads your individual credit card purchases and matches offers from advertisers relevant to your purchase history. If you buy something at Home Depot, for example, you may get a $30 off coupon from Lowes. You’ve spent money on textbooks and you get a special offer from Chegg. Etc. All offers will be 40% – 90% off normal retail, says Offermatic. Offermatic also offers users actual cash just for registering credit cards. Each month that any of your credit cards has at least 20 transactions and $1,000 in total charges, you’ll get $1.25. You can theoretically make up to $15/year on up to each of four credit cards. The company says they’ll pay that out via check or paypal. The service hasn’t officially launched yet and it isn’t clear how much, if any, outside funding they’ve received. Normally that might give users pause before entering in sensitive financial data on the site. But we’ve seen how eagerly you people jump on new services like Blippy without a care in the world, so do what you will. The fact that Yodlee is running the back end certainly makes us more comfortable about Offermatic, too.